Antarctica's Thwaites Glacier is Unstable. Antarctica's Thwaites Glacier is Unstable and would push sea levels up as much as 3 feet if it falls into the ocean. 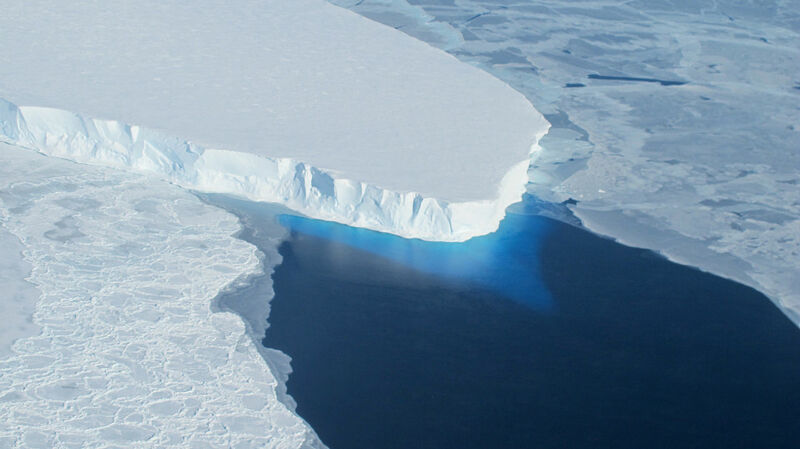 Thwaites glacier melting would push sea levels up as much as 3 feet! It's the size of Florida. Scientists from the United States and United Kingdom announced a massive five-year study aimed at finding out how stable a key Antarctic glacier really is. They'll be focused on the Thwaites Glacier, located on the western side of Antarctica. It has lost a huge amount of ice recently – enough to contribute about 4 percent of overall sea level rise – and a complete collapse of the Florida-sized glacier would push sea levels up as much as 3 feet, according to Public Radio International. The new study will be an attempt to learn more about the glacier in hopes that it'll lead to better modeling and a more exact projection of what might happen in the future. "Really, the whole program is about understanding that extra uncertainty attached to sea level rise and doing what we can to remove it, allowing people to protect their coastal environments and to prepare property to protect their populations," David Vaughan, the director of science at the British Antarctic Survey, told reporters on Monday. One reason why we know relatively little about Thwaites is because few researchers have made expeditions to West Antarctica to study it since the first trip in the 1950s, PRI also said. The glacier is some 1,000 miles from the closest research station, and weather conditions are not friendly to those who venture into the region, the report added. But this time, eight research teams will join together for the project, and they plan to study everything from the bedrock under the ice sheet to the climate above it in hopes of finding out as much as they can about the glacier, PRI added. They want to know the history of this ice sheet so they can understand how it has behaved in the past, and if there's any hope to save it during the rapid retreat period currently taking place. "There is still a question in my view as to whether Thwaites has actually entered an irreversible retreat," Vaughan told BBC.com. "It assumes the melt rates we see today continue into the future and that's not guaranteed. Thwaites is clearly on the verge of an irreversible retreat, but to be sure we need 10 years more data." About 100 scientists will be sent to West Antarctica as part of the study, according to BBC.com. It'll be the biggest collaboration between U.S. and U.K. scientists in Antarctica in at least 70 years, the report added.